Removes tar and glue with ease. Full strength formula is effective and compatible with Gtechniq coatings. Tar spots are an inevitable part of daily driving. Even if your car is protected with one of Gtechniq's ultra-durable coatings; EXO, C1, or Crystal Serum you will eventually get some tar spots on the car. Prior to the introduction of W7, trying to remove these tar spots was always cause for concern. You want your car to look its best which means removing the tar spots, however you do not want to degrade the life of your coating with a strong cleaner. That's why Gtechniq has released W7 Tar and Glue Remover! Gtechniq's W7 Tar and Glue Remover is a full strength solvent based tar and glue remover that is compatible with all Gtechniq's readily available or professional coatings. 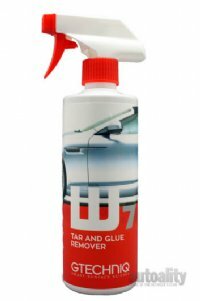 You can use W7 to remove tar spots from cars coated with EXO, C1, or Crystal Serum as well as from uncoated cars. Just make sure to rinse the paint properly and your paint finish will stay in perfect condition. 1. Spray W7 onto tar and or glue spots and allow to dwell for 5-10 minutes. The warmer it is, the shorter the dwell time should be. 2. Rinse with a strong jet of water. Repeat step 1 if necessary. a. Do not spray product onto black plastic trim, rubber, vinyl or other trim parts. b. If you accidentally get W7 onto these parts, remove immediately with your was solution. c. Store in a cool dry place out of the reach of children.